“I’m about to walk on stage in an arena in front of 14,000 people. It’s a sold out show. There’s a lot to be grateful for,” Jared Leto says from backstage in Birmingham, England. It was inspired by the song, which is on our new album Love, Lust, Faith and Dreams. It’s a song I wrote a few years ago, when I came home to L.A. after a long tour. I wrote this love letter to the city, but it’s not just about Los Angeles. It’s about hopes and dreams. It’s about what we do in order to make the impossible possible. That’s what the film is about. I spoke to people like Kanye West and James Franco about what it is they do, how they do it, and how it has affected their lives. What it’s like to make a dream reality and how you deal with some of the challenges that follow in this crazy business. The video is about life, love, fame, and everything in between. The A-listers featured in the film are remarkably candid. How did you achieve that level of intimacy? I think I have a bit of an advantage because I’m also an artist and a creative person, so they were very open and unguarded. I’ve been doing a lot of interviews the last five or six years. I’ve worked a lot behind the camera making documentaries, music videos, and short films. I’m a really curious person and I’ve always been very interested in what people have to say. These are very fascinating people, the actors and musicians, but also the people who haven’t made their dreams come true yet. It was interesting to see that side of the city. We interviewed people who are homeless and people who literally live on Hollywood Boulevard. They shared really deep and meaningful details about their lives. Are you making a point by juxtaposing superstars like Kanye West and James Franco with street performers? I’m trying to show the diversity in life. For me, when I make these little films, it’s very much like being a painter or a sculptor. You follow your gut and your intuition. The great thing about making a film like this is that there aren’t any rules, which is a very rare thing. Usually when you work on a project there’s a script, a storyboard, and a director. But in this case it was just a question of listening and following your instincts. I loved them all. You fall in love with people. When you spend all this time together with someone in a small dark room talking about their lives you really get to know who they are. There were a lot of tears and lots of laughter, too. It was very revealing. In the video the Silver Man, who performs on Hollywood Boulevard, says that no matter what, you just have to stick with what you’re doing and keep going. I think that’s important to remember. This city demands that we look at it differently than other cities. It’s the city of angels. Even the name is commanding. It demands that we see possibilities. It’s like a magnet. It draws people from all over the world and all walks of life. There’s something mythical about it. It has certainly been a magical place for me, not necessarily because of the landscape and the weather but because of the community. It’s a group of likeminded people that come together and look for ways to make the impossible possible. What was your own journey to L.A. like? I’ve always been interested in film. I started out studying painting in art school and then I moved on to film school. I ended up dropping out in my third year. I showed up on Venice Beach with a backpack full of clothes and a couple of hundred dollars in my pocket. I didn’t have a plan B. It was all about survival at that point. I think the risk and reward dynamic is amplified in L.A. There’s a possibility for so much. It’s really unparalleled. The potential is there and people come. It can be an all or nothing scenario. You’re known for being a chameleonic actor. 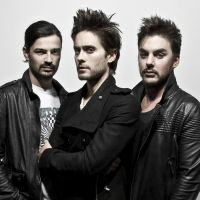 When you perform with 30 Seconds to Mars, do you feel like you’re playing a role? It’s 1,000 percent me. There’s no character there who has to conform to any kind of script. The script is my life, the role is me. Sometimes on stage you’re more yourself than you are anywhere. Previous articleVintage Los Angeles: The Moose is Loose!